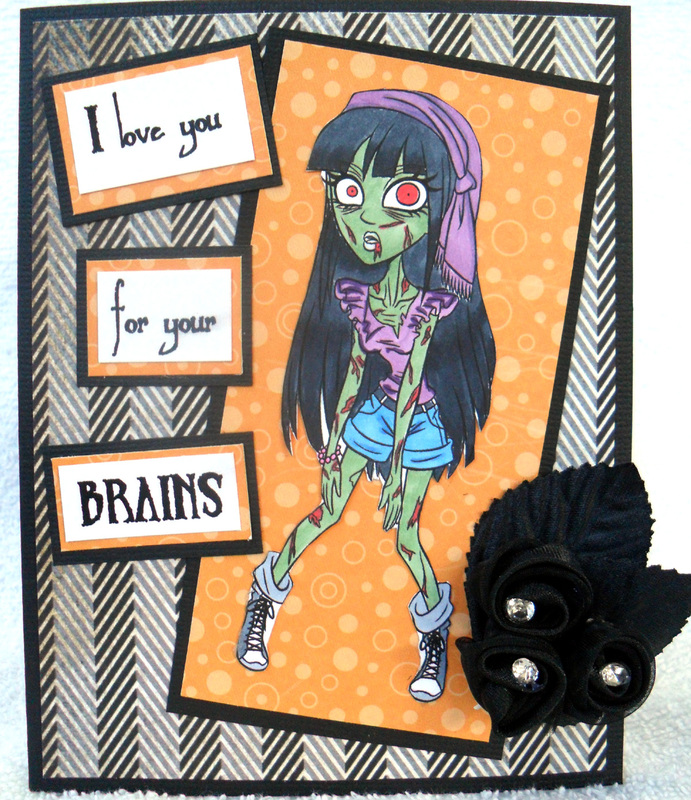 The Unknown, Entertaining Mind of Miss Dena Jones: Tickled Pink Challenge Zombie Card -- With Bling! Happy Friday, Bloggers! This week's Freaky Friday Challenge over at Forever Night Challenges is sponsored by Tickled Pink Stamps! The challenge is to add some bling to your creation. Everyone seems to be obsessed with a show called "The Walking Dead" lately. My boyfriend loves it. I have yet to watch it, though. I guess I'll have to check it out on Netflix sometime! Well, I decided to jump on the zombie bandwagon (LOL) and make a zombie-themed card. I chose to work with Zombie Kellita. Now, I don't know what's up with my camera lately, but it seems like my cards end up looking a little distorted for some reason. I promise that my card has straight edges and isn't crooked! The bling I used for my project was already in these black roses I picked up from the craft store. I actually bought them for another card I made previously, but I didn't really like them on that card as much as I thought I would. So, I had them sitting on the side and thought they were perfect for this card! Thanks for stopping by. Hope you have a great Friday! I'm in two blog hops this weekend, so I will see you soon! ALOHA! Haha! Love the card. I had no idea there was a zombie girl stamp. The Walking Dead is great. My and husband and I love it but we end up having to take breaks here and there because it gives me nightmares. I have no idea why! I'm not at all afraid of the show and horror movies and such don't usually give me nightmares. Wow what an image... great coloring too..
You had me at Zombie, super cute! This is an awesome card D girl! The Walking Dead has a marathon tomorrow - better watch it so you can catch up! LOL! xoxo!